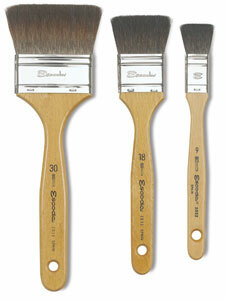 The Escoda Aquario 2032 is a flat, straight edged brush for painting broad passages, washes, and for varnishing. The short, tightly crimped squirrel hair offers terrific control, and a soft, fluid stroke. Escoda specially cures each handcrafted brush.